Watching the Cardinals beat the Tigers 5-0, totally worth it! Obviously, you are still "young" by my standards. How you could even THINK of writing in the blog when you finally got home from that Game boggles my mind! 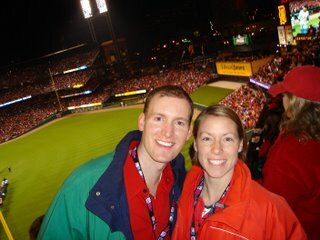 But I'm glad you had such a great time and that those Cardinals won! So, you have made it through nearly a quarter of this first year of Novitiate! God works in amazing ways, eh? One day... One moment at a time... I'm gald you are still aboard! Working late and reading your blog. Sounds like things are going well. I asked a friend who owns a medical supply rental company called First Biomedical Inc to send you a t-shirt. It has FBI on the back. Thought you could use it while jogging through the streets of St. Louis. Mary Beth and your mom are coming to visit to see Rockhurst U soon. We can't wait to see them. Love ya. We'll keep reading and praying. Glad you had fun. Do you think they'll play tonight. Anyway, maybe I'll see you at Carondelet this evening. I'm working the dinner.